It's very difficult for Me! Really hard! I would like like to meet boys and girls and practisice My English with them. I can't really do anything to help Kortny from Thailand, but I'd be curious to know the upshot of being designated a City landmark. Other than precluding some sort of teardown, how else does this affect the owners? I am assuming that the landmark status would be for the exterior of the building only. the interior lobby for the condos have been remodeled at least a couple of times. The association was looking at possibly restoring the lobbies to their original design. They have contacted Goldberg's son to assist in documentation for this effort. We currently are limited in what we can do to the exterior of our individual balconies, ie paint colors for the floors of the balconies. As a resident of the towers, I wholeheartedly agree with the need to landmark these buildings. Our architectural heritage is our greatest asset and the key to future property value. I'm sure HOB will fight this tooth & nail. Any way for you to post their submission to the Landmarks Commission? Was there any attempt to rally condo owner support? It would be great for these people to hold a presentation in the tower's meeting room regarding the benefits of landmarking. 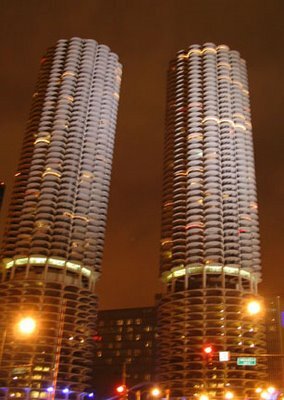 As a resident owner at Marina City, I would be thrilled if the building was designated a landmark. I am curious as to how the commercial folks will respond. Since it is a new owner, maybe they'll have a different view than that of the former commercial owners. I moved here because I loved this building as a child and I enjoy living in such an iconic structure. Hopefully, the grand days of its celebration will return. Wow! The spam is out of control here. Anyway, those buildings should be landmarked - as should some of the other '50's and '60's buildings in the city. 40 or 50 years is plenty of time to know if something is just fashionable or has staying power. Could any of us imagine Chicago WITHOUT Marina City? Spam only slightly out of control. I'm resisting making it more difficult for people to post comments by forcing them to do a visual verification. 2. If the Commission chooses to act on the recommendation to landmark Marina City, there will be an extended public review process with plenty of time for all parties to make their voices heard. 3. I also live in Marina City, and if some of the condo owners want to band together to make a statement in support of designation, that would certainly be useful. 4. I don't know how to help Kortny either, but Kortny's English already appears to be much better than mine. Don't forget that Marina City is also featured on the cover of Wilco's album "Yankee Hotel Foxtrot". I love Marina City. If I ever leave Wicker Park for the Loop area, Marina City would be about the only place I'd want to live. I'm all for landmark designation in the city of Chicago. Let's look south. Jeffrey Manor should be definately designated as a city landmark. I'm a member of The Jeffrey Manor Community Revitalization Committe and have researched Jeffrey Manor. Let's take close look at this area. These homes took a national home builders award for layout and construction in the 1940's.